While these issues appear to be very U.S. centric, the true issues behind each of these — influencing policies and practices to improve the quality of education are universal! So, we want our Canadian members and other international members to provide input and feedback as we work through these issues. What do we need from our members and colleagues on these four (there are many more but these happen to be the most pressing this month) issues now and in the near future? NDD United, a campaign representing 3,200 organizations working to stop budget cuts to core government functions has released a video that you can use to educate policymakers, the press and the public about the disproportionate cuts non-defense discretionary programs — including employment and training, research, public health, education, public safety, housing, social services, infrastructure and environmental protection — have taken as a result of deficit reduction efforts and how these cuts will impact our daily lives. Click here to view the 3-minute, NDD United "No More Cuts" video. Forward this message and share the video with your colleagues, blogs and through social media (on Twitter use #NoMoreCuts). NDD United has created a toolkit for suggestions on how to share the video. Join us on Thursday, May 30 from 9 a.m.-5 p.m. ET for an NDD United Twitter Storm to Tweet your Members of Congress with stories of impact, links to articles and blog posts, and to urge Congress to find a balanced approach to deficit reduction. Use #NoMoreCuts join the conversation! How are these cuts impacting your program? How will that affect your program ability to provide vital core public services? Will staff be reduced? Will those that depend on the services your program provides have less access to critical services? Will waiting lists expand? These stories are needed to help us paint a picture for policymakers, press and the public of the real world impacts these cuts will have. 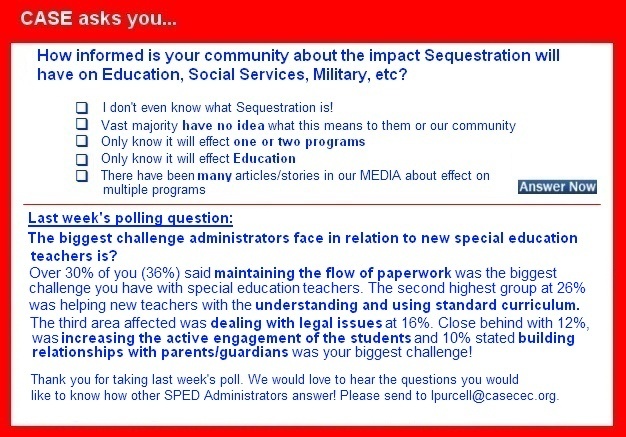 Share your story about the impact of the sequester on your program at http://www.nddunited.org/#!contact/ch8q. Disastrous Budget Cuts | Providence Journal, Emily Holubowich, Joel Packer and Rachel Gragg, April 18, 2013. Policymakers in Washington are beginning to accept sequestration as "the new normal." It's vital that we continue to educate policymakers and the press on the harmful impact of sequestration and encourage a balanced approach to deficit reduction to stop these cuts, once and for all. Please help us spread the word on how these cuts have real impact on real people! The U.S. Government Accountability Office recently conducted a nationwide study to catalog and assess the test security procedures and allegations of cheating on state administered assessments. The study was meant to determine where states were using leading practices in test security to prevent irregularities, what oversight states used in ensuring school officials are following test security procedures, how often that oversight lead to the identification of cheating, and finally, on what resources are school officials relying for assistance and what further assistance would be useful to them. As mandated by Congress, the U.S. Department of Education's National Center for Education Statistics, a division of the Institute for Education Sciences, has compiled and released the 2013 edition of "The Condition of Education," which reports on statistics collected during the 2010-2011 school year. This report presents information based on 42 indicators of the condition of education, such as attainment, economic outcomes, demographics, preprimary education, enrollment, school characteristics and climate, and finance. Up to 20 percent of children in the United States suffer from a mental disorder, and the number of kids diagnosed with one has been rising for more than a decade, according to a report released by the U.S. Center for Disease Control and Prevention. Mary Skinner-Alexander, a high school special education teacher in the Sioux Falls, S.D., district, has a student who communicates by directing his gaze at printed cards. Other students in her self-contained special education class of ninth- through 12th-graders are reading at the level of early-elementary students. And all will be expected to learn — and be tested on — academics based on the Common Core State Standards. When Neil Virani walked into his middle school special education classroom at Mulholland Middle School, part of the Los Angeles Unified School district, three years ago, he encountered a roomful of students with a range of cognitive, emotional and physical challenges. But the most toxic problem they had to combat was the low expectations from the school system they'd been in since kindergarten. "All they had was coloring books and watercolors. They were not working on any academic aspects of the curriculum," he says. As a new round of budget talks gets underway in Congress, special education advocates are sounding the alarm about big cuts that may be on the horizon. Preliminary figures from the U.S. House of Representatives Committee on Appropriations indicate that education programs could be slashed by nearly 20 percent for the fiscal year beginning Oct. 1, partly as a result of the sequester, the across-the-board spending cuts that took effect in March. Though detailed proposals have yet to be released, the Council for Exceptional Children — which lobbies on behalf of special educators — is estimating that such cuts would mean more than $2 billion less for programs under the Individuals with Disabilities Education Act. Republicans controlling the House of Representatives pressed ahead May 21 with a plan to slash spending on certain domestic programs — including education — far deeper than the cuts these departments already face under a painful round of automatic austerity. Military Construction/Veterans Affairs, Homeland Security and the Pentagon would be spared under the plan approved by the House Appropriations Committee on a party-line vote, but total funding for education, health, and labor programs would absorb a cut of 18 percent below fiscal year 2013 levels adopted in March. In its final report released in February, the U.S. Department of Education's Equity and Excellence Commission issued a clear and powerful charge: Efforts to improve our school system "must start with equity" — particularly the equity of resources. To achieve this goal, the commission instructed all levels of government to improve or redesign their methods of funding schools in order to adopt truly equitable funding systems. In calling for equity in funding — which the commission defines as providing sufficient resources "distributed based on student need, not ZIP code" — the report tells policymakers the "what" of school funding reform, laying the groundwork for improving school quality. As more and more schools hop on the 1:1 or BYOD bandwagon in one way or another it is important to deeply consider proper implementation. While there is the promise for engaged and inspired learning, these large-scale implementations also present potential pitfalls for school districts that must watch the bottom line, provide adequate support for teachers new to the technology, and engage families in a dialogue about these powerful pieces of equipment that are going to be coming home in Johnny's backpack each night. Teens who have a classmate die of suicide are more likely to consider taking, or attempt to take, their own lives, according to a new study. The idea that suicide might be "contagious" has been around for centuries, senior author Dr. Ian Colman, who studies mental health at the University of Ottawa, told Reuters Health. Past studies supported the idea, but none had looked at such a large body of students, he said. Graphic novels may have a place in the classroom as an alternative form of literature, according to researchers. Diane Lapp, distinguished professor of education at San Diego State University — along with researchers Thomas DeVere Wolsey, Douglas Fisher and Nancy Frey — surveyed elementary, middle and high school teachers about the effectiveness of using graphic novels in the classroom as well as their willingness to use the material for primary instruction for their students. Craig Haas, a licensed special education administrator at Edwards Middle School in Boston, writes: "In assembling the plan for expanded learning time at the Edwards Middle School, we drew inspiration from our own special education department. Too often, special education is viewed as a place or a static state, when the truth is that special education is a series of interventions, modifications, and accommodations afforded to students who are unable to access a curriculum under routine circumstances. ELT, too, is a series of interventions, and so, in applying some special education principles, we gained some valuable insights." The rigorous Common Core learning standards that have been adopted by 45 states represent a once-in-a-generation opportunity for the United States to improve public schools nationally, bringing math, science and literacy education up to levels achieved by high-performing nations abroad. The Department of Education has rightly pushed the states to jettison outmoded systems in exchange for a challenging, writing-intensive approach. But the department, which has set a rapid timetable for this transformation, will need to give the states some flexibility so that teachers — who themselves are under pressure to meet evaluation standards — can adjust to the new curriculum.